Looking for a Halo Diamond Engagement Ring? Why not, Halo Enagagement Rings have taken over as one of the most popular styles in recent years. Originally popular in the 1900s, halo designs offer a timeless, vintage style with smaller diamonds encasing and complimenting a larger center stone. Like an angels halo the Halo Engagement rings circles and accents the natural beauty of your main diamond in the center. Diamond Halo Engagement rings as well are a way of really making a statement without spending your entire lives savings. Halo rings are a perfect way to maximize carat weight and enhance the size and shape of the main diamond. 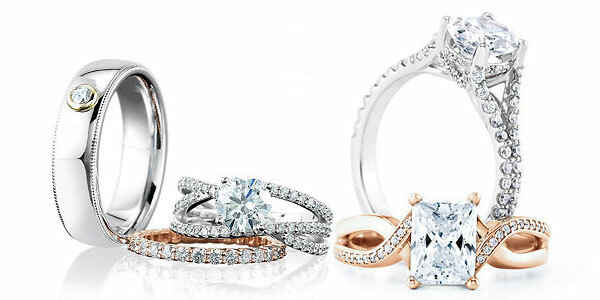 We have Diamond Halo Engagement Rings in yellow gold, white gold, rose gold, & platinum. We also have a large selection of G.I.A. Certified Diamonds that are laser incribed with a full report about your diamond. Stop in today and let us find the perfect Diamond Halo Engagement Ring.